So, remember how I recently mentioned that I’ve been putting off debt payments (above minimums) until late in the month? Well I just made my last payment for the month – a GIANT payment to our car loan (hopefully a post will be up Thursday specifically about that. Right now the payment is still pending, so I want to wait to see what my car balance will actually be after the payment is applied). After making that mammoth payment (literally one of the largest single debt payments toward a loan that I’ve made ever in my life), I decided it would be fun to play around with some numbers and see how I’m doing on my 2015 financial goals. Just as a reminder, I had 2 concrete financial goals for 2015 (these are in addition to my “year of becoming an adult” goals. Latest update on that can be found here). Pay off car loan and become consumer debt-free by the end of 2015. Pay $30,000 toward debt in 2015. When I did my last goal check-in things were looking a little leery. We were a good $8,000 behind schedule to hit the $30,000-mark. Then a few more months went by with more mediocre debt payments. I admitted defeat on the possibility of paying off the car this calendar year. Then, as fate would have it, the tide shifted a bit. Hubs’ business has been on the ups, I’ve been making good money, and we decided to skate thin ice with a very low financial security net in exchange for getting debt paid off quick! After checking out our YNAB budget, I came up with these figures. I couldn’t believe it when I hit auto-sum and discovered that our estimated 2015 debt payments amount to…..
Well hot damn! My jaw just about hit the floor. Of course, these are estimates and there is no way to tell for sure if we’ll be able to hit these goals (psst: we’ve met the goal for October. I’ll get you a debt update post up soon; Thursday?). November and December are contingent upon how hubs’ business income is (and December, in particular, may be a struggle). But look how close our estimates put us to our $30,000 goal! It’s just that much more incentive to bust our butts and really try to make this thing happen! It’s great to be filled with hope and excitement, especially this far along into debt repayment (we’ve now been in steady debt-repayment mode for over a year and a half). The shiny new-ness of it all rubbed off a good while ago and we’ve been sustaining on sheer will-power. So it feels good to have a little morale boost, especially headed into the holiday season! Let’s cross our fingers that things continue full steam ahead (especially in regard to hubs’ business income) and see how close we can get to really reaching these goals! Are you gunning for any big financial goals before the end of the year? Do you make annual financial goals? I, personally, like to make annual goals in many different aspects of life (e.g., career, financial, health/fitness, etc. etc. etc.). If you’re like me, it’s time to start thinking about and planning for 2016’s goals soon! glad to see you make such progress. I bet that feels good that the 30000 are still in the realm of possibilities. maybe you don’t want to discuss this here, so I am fine with if you say it’s not something that belongs here. But, since you’ve mentioned hub’s business. I am just curious: You’ve mentioned no-income-months and good-income-months at his end. but is there actually the possibility of a negative income month? So that he’d have to put money in for repairs etc.? Am I remembering this correctly that hub’s has to do provide repairs if something doesn’t hold up? If so: how do you handle a scenario like that? where would that kind of money come from? Does the business have a EF as well? Hi Kili!! Thanks for the well wishes and the question! In general, I try not to talk too much about hubs’ business simply because he’s the one running it (not me), so I don’t want to talk too much on his behalf. But that being said, yes you are correct that there can be negative income months. Fortunately, that hasn’t happened a single time since I’ve been blogging here but they were more common about 4-ish years ago when he first started his company. He does have a business EF, but there have been times where even his EF has been depleted. In that case we have had to use our own family income/savings to pay for business related expenses (because, legally, we as individuals are financially responsible for any business expenses if the business can’t cover it; although we try to keep business fund and household funds as separate as possible). So, at least in the last couple years, any major business related losses have been handled by the business and only impacts our family in terms of having a reduced income during the month (as opposed to having to dip into family savings to cover losses). Make sense? I hope this answers your question! Great job! My debt repayment is quite boring most of the time… one large payment during bonus time and monthly regular payments supplemented by little snowflakes here and there. You’re an inspiration! Thanks Angie! Debt repayment isn’t all fun and games! A good chunk of it is just keeping your nose to the grindstone and plugging away! You’re doing good work! Thanks for reading! Congratulations on the monster debt payment! Very much hope you are able to hit your projections and close out the year strong! Nice job Ashley! I fondly remember draining my emergency fund the instant there was enough cash there plus in my checking account to pay off my car. I rationalized that it was definitely an emergency to never have car debt again!! Thank you so much for sharing this. Honestly, I never really thought about making an annual goal for paying off debt. 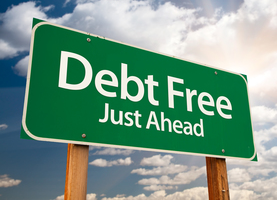 My goal was simply: become debt free, whatever it takes. With almost $200,000 in debt, it’s definitely going to take more than a year. But I love that right now you have this great way to push yourself to reach these goals: this idea is AWESOME. Thank you for sharing it. I will definitely be implementing it as 2016 approaches. What is your new goal for 2016? Can I ask? Or should I simple keep following along to find out (I’m fine with that too)? Love your blogs!! 🙂 We’re on our own journey to pay off debt and writing about it at my blog. If you’re interested, I’d love to have you check it out. I love how you are pushing yourself…..it would be much easier to just coast and pay what you can, but I applaud your passion to get that car loan gone!!!! !